Balloon animals are both mysterious and magical, but when they pop or deflate, it`s a little disappointing, and maybe a bit sad. This sculpture is certain not to disappoint you, because it`s made from cold cast resin, not latex, and is sure to last for years! 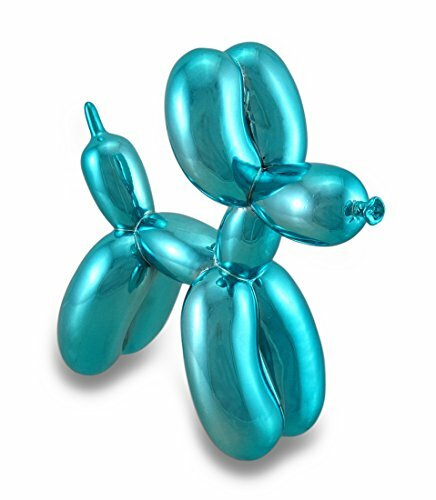 This fun balloon dog is hand-painted in a metallic blue chrome finish that really shines, and will add whimsy to any shelf, bookcase, dresser or night stand in your home (or a friend`s! ), and makes a unique accent in an office. It measures 6.5 inches (16 cm) tall, 6.75 inches (17 cm) long and 2.75 inches (7 cm) wide, and makes an amazing gift for any balloon animal enthusiast! Manufacturer: Green Tree Products, Inc. Publisher: Green Tree Products, Inc. Studio: Green Tree Products, Inc.